Eau de Pamplemousse Rose (above center) and Eau de Gentiane Blanche (above right), along with longtime favorite Eau d'Orange Verte (in new packaging, above left, and celebrating its 30th anniversary this year), make up the new trio of unisex colognes from Hermès. I went to visit them recently at my local Hermès boutique, and had Pamplemousse Rose purchased and packaged within minutes. One of these days, I need to sit down and figure out the proportion of my perfume spending over the past few years that has been made up of fragrances from perfumer Jean-Claude Ellena — I'm guessing it's substantial, and certainly it accounts for many of my on-the-spot purchases. But I'll start with the good news: I did not need a bottle of Eau de Gentiane Blanche. Amy Verner, writing in the Globe and Mail1, called it a "haute fresh laundry fragrance, soapy yet subtle", and that's right on the money: it's possibly one of the nicest laundry-clean fragrances I've ever smelled, but there's really almost nothing you could do with a laundry-clean fragrance, haute or otherwise, that would make me want to own or wear it. Gentiane Blanche starts out with bright, orange-y citrus before moving rapidly into a clean musk (the notes: gentian, white musk, iris and incense). I don't know gentian, but Gentiane Blanche smells briefly like lavender to me, then softens into something I can only describe vaguely as "wildflower" and/or "flowering herbs". Eau de Gentiane Blanche is slightly green, slightly bitter, slightly powdery and slightly root-y. There is more iris than incense in the early stages; later, the incense is more noticeable, and then Gentiane Blanche feels more dusty than powdery. It isn't a heavy scent, but it has reasonable sillage and lasting power for a cologne-type scent, especially if you apply lavishly — as presumably you're meant to. I found it surprisingly enjoyable to wear for a few days, and far more interesting than I expected, but in the end it's still too clean and fresh for me. If you like clean and fresh, do give it a try. Eau de Pamplemousse Rose, on the other hand, captured my affections instantly. The opening is a bright, effervescent mix of grapefruit and orange, heavy on the grapefruit peel and beautifully tart (other notes: rose, rhubofix, vetiver). It reminded me of a just-poured Fresca on ice. The sparkle doesn't last nearly as long as I'd like, but there you are, and the grapefruit, at any rate, lingers for quite some time. The grapefruit teeters just on the edge of hard-to-wear, as grapefruit is wont to do; most of the times I wore it, there was just the slightest undertone of something sweaty in the early stages — not at all unpleasant — but one day for some reason it steered a bit uncomfortably towards Guerlain's Aqua Allegoria Pamplelune. Pamplelune, if you've never tried it, is a fragrance that you can either wear or you can't, and I'm quite firmly in the can't group. I ended up layering something else on top2. I find the rhubofix (an aromachemical described as having “a zesty freshness and unique green rhubarb effect”) very noticeable on paper, less so on skin, and the rose is literally just a tinge, as though you'd nearly reversed the proportions of Hermès Rose Ikebana. The lasting power is not quite so good as that for Gentiane Blanche, but is still reasonable for a summer cologne, I suppose: I wanted to reapply after a couple hours. Hermès Eau de Pamplemousse Rose and Eau de Gentiane Blanche are available in 100 ($125) and 200 ($165) ml Eau de Toilette. 1. Via Globe and Mail, 4/18/2009. 2. I can't remember what I layered it with, but I tried it later over Terre d'Hermès and loved that combination. It's amazing how many things layer perfectly with Terre d'Hermès. 3. I was curious how much Hermès charged for the Jardin fragrances, having never paid full price for one, and was surprised to see that they're also $125 for 100 ml. Those, at least, are available in smaller sizes, and are easily found at discount. Hopefully the Pamplemousse Rose and Gentiane Blanche will also be at the discounters soon, but hopefully not so very soon that I'll be mad that I paid full price. This is much, much drier (& less fruity) than In Love Again. Do give it a shot! Ah, YSL In Love Again is also Ellena? That’s why I haunted it for years… I wore a couple of bottles:-) and Eau de France from Rancé I bought only because it’s a nicer version of In Love Again. Now this review makes me struggle because Eau gentiane sounds exactly like *loveafterthefirstsniff*. And grapefruit and rose? Of course! But I’ll stay strong and wait patiently for my birthday and get the trial Hermessence. Yes, ILA was by Jean Claude Ellena. But just to be clear — these new ones aren’t in the Hermessence collection. Ah, okay, thanks Robin! I found them now in store; they are too expensive I think. The PR did last in a very subtle way on my skin the whole day; but I wish they would do them in splash bottles. Still, they are far too expensive, a clear NO to them for this price. My love goes far to JCE, but not far enough I suppose! Do you think btw the Jardins and the Cologens and Rose Ikebana are all different variations of the same “scent”? They are pretty similar all/have a lot in common. Like them all! I think maybe the larger bottles are splash, but I’m not positive. Many, many of JCE’s fragrances work with similar themes & notes — they all seem related to me! I smelled these two recently, though only on a card, and they seemed very nice. I remember having read somewhere that Ellena specified that the name “pamplemousse rose” doesn’t refer to pink grapefruit but to the grapefruit+rose combo. To me, though, it smelled like freshly squeezed pink grapefruit (which itself is a nice thing), while Pamplelune, which I like too, reads more like freshly squeezed (not pink) grapefruit. Oh and, as we’re talking Hermès, Vanille galante has very much grown on me, I’m wearing it a lot. Could be more than a fleeting love affair, so when I finish up my samples it could definitely be my next full bottle purchase. Glad to hear Vanille Galante has grown on you…I am loving it even more now that the weather has warmed up. Great spring scent. Woman, are we in sync or what? I am test driving Eau de Gentiane Blanche today, and I actually like it! On me it is very rooty, from the iris and peppery, from the incense I guess, with just a hint of soft musk. The staying power is pretty good. Tomorrow I will wear the PR. I think these are going to Nordstrom, but I may just wait for the discounters. Funny, you stated that the PR captured your affections immediately, but as I read more about your thoughts, you did not sound as enthusiastic about it. Perhaps you were just giving us the facts to let us judge for ourselves? I do hope that you are still loving it, darling. Gosh, didn’t mean to sound less enthusiastic at all but I can see that I probably did. No, I adore the Pamplemousse — it’s going to be perfect for summer. Come back tomorrow & tell me which you liked better! Pamplemousse Rose sounds beautiful, yet another Ellena to try (still haven’t tried Vanille Galante) … I do love Ellena and so many of my very favorites are by him (I’m wearing Bois Farine today). Has his book come out yet, do you know? Oh, too bad, I was hoping it would be summer reading. Too bad it sounds like it might not be new material either. Thanks for the info! I was happy even with old material since I can’t read French, but looks like we’ll have to wait. I can confirm that the book is a translation of the French Que Sais-Je? Le Parfum reviewed on NST by Marcello, and that publication is, for the time being, suspended. I’m an Ellena fan, too. When I was traipsing around Philly awhile ago, Eau D’Orange Verte was my go-to walking around scent. Terre D’Hermes is also a fave, and gets me the most compliments of anything I have. I’m tempted by the Pamplemousse. Even though grapefruit is overdone these days, I’d be open to his take on it. I also don’t do the laundry fresh thing. It’s just not slutty enough. I would guess that it’s a “remember the comfort of youth clean clothes” thing, but who knows. oh! I guess JC didn’t do Eau D’Orange Verte. I have to read more carefully. But now I’m starting to think about Un Jardin Sur Le Nil and craving it. Well, my fault too — I did not specifically say! 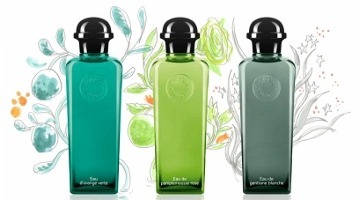 The Eau d’Orange Vert is by perfumer Francoise Caron, the 2 new ones are by Ellena. And if you love Terre d’Hermes, do try the Pamplemousse layered! For that matter, wonder how Terre d’Hermes + Eau d’Orange Verte would be? Hmm, now you have me wishing I were home so I could layer TdH and EdOV. I’ve never layered TdH with anything (I’m not adept at layering, I think), but it’s an interesting idea. If you try it later, tell us how it is! And I don’t think I’m very adept at picking things to layer either. Reporting back here from my layering “mission” also. Samba is right: these go together very well and Terre almost eats EdOV. Still, the orange adds a nice sweetness with an added dimension of citrus that plays well with Terre’s citrus. The mineral and vetiver notes of Terre add a certain complexity that EdOV on its own might be lacking. It might actually be interesting to mix (gasp!) both of these in an atomizer, maybe in a TdH:EdOV ratio of 1:2 or 2:3. Joe, great, thanks for the report! You know, I’ve never tried mixing in an atomizer, I just layer on skin. I tried layering Terre D’Hermes with Concentré D’Orange Verte (I’ll get these straight yet!). Pretty cool. Terre is so strong that it definitely took the lead, but Concentre added a nice green top to it. To me, Terre already has a orangish quality to it, so it was like A Clockwork Orange, maybe. A little bit of the department of redundancy department. But nice, and if I try it again, I’ll spray heavier with the Concentre. I don’t layer much, so this could be the start of something fun! Good idea! Hey, thanks for another report! Terre d’Hermes makes a really great layering agent, but yes, do experiment with other things. And the layered scent made me smell good for the Dancing With the Stars final! Great review, I feel like I’ve already got a vague idea of how it smells. I really like Rose Ikebana, but do find it a little flat sometimes, so I’m sure I’ll like Pamplemousse Rose. I’ve never been horrified by the idea of smelling clean, like most perfumistas are, but the lavender in Gentiane Blanche isn’t really selling it to me either. Always loved Eau d’Orange Verte, on myself but especially on men. Lavender isn’t listed in the notes and I don’t think I’ve seen anyone else mention it, so don’t avoid it just for that! I smell it only in the early stages anyway. That’s good to know. You’ve also just prompted me into spraying my 15ml bottle of Rose Ikebana, and actually I don’t know what I was talking about earlier…d’oh! It is restrained and subtle, most definitely, but isn’t flat! The sparkling topnotes don’t last long enough though, and I expect more grapefruit would help with that. Would you say Pamplemousse Rose was a more masculine fragrance than Rose Ikebana? Yes, at least, it doesn’t smell masculine but it smells unisex, whereas Rose Ikebana tilts towards feminine. The Pamplemousse Rose is much less floral. I am the lone lover of gentiane blanche. On me there is nothing clean about this scent. At first there is a dominant sweetness which immediately gives away to rich slightly sweet rooty iris. A friend tried it and it was soapy and astrigent. She adored pamplemousse rouge and on me, it was an aroma-not a cologne -pure pink grapefruit. we are all so unique, like fragrant fingerprints. I’m sure that’s not true, I’ve seen lots of positive reports on GB. Fragrant fingerprints! I like that. Here is where I confess that none of these, including Orange Verte, really sound like my cup of tea. PR probably comes closest, but hey – I’ll save my cash. Whereas I would cheer if they would only announce a 15-ml coffret. Because after all, isn’t that what any good trio should have? I have 15 ml bottles of several Hermes fragrances that I never saw advertised as being available that way, including Kelly Caleche & 2 of the Jardins — so keep your eyes peeled on eBay & the discounters, they do appear! memechose-make that two of us. I loved GB too! On me, it was very nice and dry. Absolutely loved the drydown and it lasted well. Me three! Well, almost. I haven’t tried it yet, but it just sounds like one I will love!!! Oh, and forgive me for a little side question, but…. does anyone know, has Sephora stopped carrying Hermes, or is it just my pitiful little store? On my last several trips, I noticed a sad gaping hole where the Hermes used to be. Pretty sure my local Sephora still has a small selection, but will check next time. Outside of a Hermes boutique, Neiman Marcus seems to have the biggest selection. Yeah… No boutique near me that I know of, and the only NM is downtown Mpls, and I just don’t go there anymore. As in, won’t. Yes, I’m becoming my mother. Already. this is completely off the wall and probably has nothing to do with perfume, but have you ever noticed a common thread or link personality-wise, in those you know who (also) love fresca??? that they mostly seem to like a lot of the same things. a lot of those also being off the wall??? yes, i know that sounds like a crazy question. But it’s almost like there is a clique out there of grapefruit-type fresca lovers for whom nothing else will do…..
Gosh, I’m not even sure I know anyone who has ever mentioned Fresca to me. And have to admit I never loved it nearly as much after they switched to nutrasweet. Hey, I used to love Fresca, and I’m definitely off the wall! I don’t really drink soda anymore, but I did love it back in the day, so maybe I’ll have to give PR a shot. Yeah, I liked Fresca too. It disappeared from our local stores a loooooong time ago. I will reserve judgment on the Gentiane blanche – the notes do sound appealing as I am a big iris fan, and if its cleanness stays the right side of L’Ete en Douce, I don’t mind clean. And it may not be clean on everyone, as memechose said. But I don’t do overly “rooty” either, and have a love-hate relationship with certain rooty iris scents like TDC Bois d’Iris or SL Iris Silver Mist. So I would want the rootiness to be held in check, or the roots washed off slightly at least by the haute laundry products. The Pamplemousse Rose is not calling my name, however, for even Rose Ikebana is too grapefruity, and there as you say the grapefruit played a bit part! I may come back to my new love, Vanille Galante, of which I now have 8 complimentary ml, which will last me for a long time to come! In that very particular niche of salty lily scents, it is my HGS, no question. LOL…yes, that is a VERY particular niche! Nice review, Robin. Are these already being sold by retailers who carry Hermès, or still boutique only? Pamplemousse sounds nice, since I’m a grapefruit (and citrus) fiend. Pamplelune doesn’t turn horrid on me until about an hour in, but then it’s definitely not nice. I’m glad that this steers clear of that mishap. I think I’d like this even better if the “rhubofix” were more prominent. Like a cologne version of Byredo Pulp or something. I’ve seen them at other retailers (online) overseas, but not yet in the US. Don’t think they’re meant to be limited distribution. Robin, I was as struck as you were by the reversal of the grapefruit/rose balance in PM and Rose Ikebana. I do get quite a bit of rose in PM but it’s quite transparent and gently powdery. Yes, he does, since as someone mentioned above it’s also a theme of In Love Again. Did not notice it so strongly in the KC EdP, but have only worn that once so far. I loved, loved, LOVED Eau de Gentiane Blanche, but I hardly thought of it as laundry smelling. Much more sophisticated than that. It was calm and serene. Incense with touches of green and pale woody notes. It was like a better executed version of Kyoto but much paler and sans coffee. I found Rose Pamplemousse too sharp for my liking, one who thought that Jardin sur le Nil too sharp at first, but came to like for one of my favorite summer scents alongside of L’Occitane Citrus Verbena (ultimate fave), Dior Escale a Portofino, and Paul Smith Story. I choked at the price when the SA quoted it to me at Hermes. As much as I would want Gentiane Blanche in my arsenal, it’s too much for an EdC. I gotta be at a vulnerable state (fighting it off right now) and wait for it to appear at a retail discount website (and hopefully soon). LOL…the minute I walk into a store to smell a new Hermes fragrance, I’m in a vulnerable state! I found that EdPR fell apart on my skin in a big mess. I posted yesterday (I think on Perfume Posse) that if it were corporeal, it would have the texture of an egg and chartreuse-colored. I wasn’t terribly enthralled. However, I do love me some Fresca! I really liked EdGB but I didn’t think it particularly laundry-like. Maybe it’s one of those things that, once pointed out, taunt you every time you look back. Like the arrow in the Fed Ex logo. I was impressed with the sillage on these and I have to wonder if Ellena makes the most expensive scents the most transient on purpose. But did you find the GB that transient? I sure don’t, in fact, I can still smell the musk after I shower hours later. Oh, no. I meant that both EdC had pretty nice lasting power. And I realized the only work for Hermes Ellena does that doesn’t last turns up in the Hermessences. Hi Robin, great review! I tried these recently, and loved both enough to purchase on the spot but didn’t. I am trying to be good (for the time being). I really loved the PR though, still thinking of heading back to purchase. ps-I can’t remember if I mentioned it earlier, but the Hermes boutiques are still carrying Hiris. The SA mentioned that the body products are discontinued….. Yes, my store has Hiris still too. I never even tried the body products so at least I won’t miss them! Oh dear. I’m so crazy about Monsieur JCE but I’m not having much luck with his recent creations. Vanille Galante has too much lily for me, and even Rose Ikebana has too much grapefruit so I’m certain the Pamplemousse won’t work. Will try the Gentiane though! Do try the GB then…really doubt you’ll like the other if you didn’t like the grapefruit in Rose Ikebana. Well, now you have me yearning to try Gentiane Blanche. But, since Rose Ikebana had too much grapefruit and rhubarb and not enough rose, I can pass on Pamplemousse Rose. Good to know! Hope GB will work out for you, and yes, you sound like someone else who might as well skip PR! Yum! Really looking forward to trying these, and to their showing up at the discounters later. But I love it when you cave and buy a bottle on the spot, R., I feel less guilty about my compulsive vintage buying for days, afterwards. The musk in the GB seems to be drawing out widely differing reactions on the boards, in part by gender. And thanks for the layering tip for the Pamplelune! I love both it and TdH on their own, especially in summer, but can see how the vetiver would really amp up the patch and give a crisp edge to the Pamp. Though I like that almost rotten softness, myself, LOL. Something about “for days” absolutely cracked me up! And do tell, because I hadn’t noticed…are women liking GB better, or men? I’ve just noticed some men chiming in about the musks–you can see some comments on the PP thread. They don’t seem to find them particularly “clean.” I do find that male skin often unsweetens or amps up the dirty bits in frags, though that is so perfectly in line with gender stereotypes that I sometimes ignore it…heh. “For days” — does it make you laugh that my relief is so shortlived? Well the PR has my tongue hanging out (most unattractive, I assure you) but that’s pretty pricey for EdC….and I’m trying to be good here! I love Rose Ikebana but it lasted 15 minutes on me…so if this is as short lived I’d have to pass….even though I’d probably knock old ladies down to get to a test sniff…. Have you tried Rose Ikebana on fabric (instead of skin)? It certainly doesn’t develop the same, but it lasts for days. I actually took a handkerchief to work with the scent on it yesterday, and it STILL smells tonight. When I wear it on skin, I like wearing long sleeves and getting a teeny tiny bit on the fabric so that it lasts longer. I love Rose Ikebana. Thankfully, it lasts okay on my skin, too. I can’t wait to try both Gentiane blanche and Pamplemousse rose, especially the former. From the comments, it seems that Gentiane actually has an appreciable gentian root note–it’s an aromatic root that was used in tonic-type sodas in the early part of the last century. The old-fashioned (American) soda Moxie has a lot of gentian, as does a French liqueur called Suze; it’s bracing, bitter, herbal, rooty, and fresh all at once. Yum! Never heard of Moxie…is that easily found? I want to try that soda now (though I find my love of Bitter Lemon soda hard enough to satisfy here on the west coast). It was pretty much a local product (New England) by the time I got to know it, vacationing with my grandparents. You can find it in pokey stores in the northeast U.S., and now you can get it on websites that have “local specialties”. The soda isn’t that expensive, but the shipping will kill you. And my thanks to both of you — had never head of this stuff, now I want to try it. Oh, I liked Suze! One more reason to try the Gentiane. Ugh, I love Grapefruit fragrance…why are you tempting me to try this? I already plan on splurging on that Sisley number 3….this is entirely to dangerous. I have a feeling I would love this one. Try this one first — it’s cheaper! You can buy the 200 ml bottle for the price of the 100 ml Sisley. I have bought the Pompelmousse Rose in Spain on EBay, the 15ml bottle for 14E, and YES it is JCE Cologne, very Hermes, I like it, a lot, but in Milano Hermes boutique I tried the other and I have to say that is good as well, interesting, fresh, not common, with its own personalty, the thing that a lot of fragrances miss nowdays. Wow, great to know there’s already a 15 ml bottle out there, thanks! And of course, glad you like it. So, OMG, I just saw this in the Rome airport — I don’t remember my impression of the Gentiane Blanche but the Pamplemousse … pfff … nothing at all. It was a wonderful blast of tempered grapefruit, then it was gone in 10 minutes, if that. No experience of rose at all. Hi Robin, have been here all this time, but have gone into lurker mode. I just made a visit to the holy shrine of the Officina Profumo Farmacia di Santa Maria Novella: it is like visiting a church, the salesladies are the high priestests and the sample spritzes are the divine wafers. I have photos if you want to use them. I also took some photos of mailboxes, you are welcome to them for your Monday find-me-a-perfume feature. Hey, welcome back! I’d love to see your pictures — if you get a chance, send to robin at nstperfume dot com. My oft-repeated story is that I went to SMN in Florence before I was interested in perfume, walked around & admired the building & bought nothing! Hi — chiming back in on this old thread. Much as I love grapefruit, after brief testing of both, the Gentiane is winning out. The beautiful “Fresca blast” is gone within minutes, and the whole thing in Pamplemousse disappears on me very quickly. Fleeting can be okay, but not *that* fleeting. Gentiane doesn’t evoke “clean laundry” for me in any way — fresh, but more a green, earthy, herbaceous freshness. It’s going on my ebay search list. I’d love a bottle of some size. Joe, have been reading lots of great reports…looks like more people agree with you than with me! I tried them few days ago and when I smelled PR said to SA that top notes smelled exactly like Pampelousse Perrier (my favourite summer drink). But I didn’t want to buy it because of the price. Few days passed. I was experimenting with my new found love – L’Heure Bleue – way too much – so I got tired of almost everything that smelled. And that’s when I understood that I don’t have any good citrus cologne. So I got to my nearest store and bought 100ml of PL. I love the Perrier note and I like the rose. The spices I find very similar to those in Bvlagari the vert EdC. But PL is much less sweet. The packaging is also amazing – very Hermes. And the kindest SA gave me three 2ml samles of PL for my purse. Amazing day! Congrats on your bottle! Agree, the packaging is very nicely done. Robin, I also loved the Pamplemousse Rose. It is 88 euro here for the small bottle. It is horrible that the only things I like lately are so expensive. This one and the Sisley 3 am I really in love with. Neither have been purchased because of the price. Yes, it is hardly a bargain. I do think it will show up at the discounters though, if you wait! Okay, I eventually caved and bought them both. And with all this talk of layering, I started doing the same, but within the trio itself… first with PR and GB… it is vry different, and after a couple of tries at it, I feel kind of silly not wearing them together, almost as if JCE may have missed out in a bigger seller if he had mixed the two and sold it as one… the herbacious green in GB is tempered nicely against the bitterness of the grapefruit and semi-sweetness of the rhubafix in PR, while GB’s incense dances quietly aganst the rose notes of PR… it is a wonderful experience. Don’t get me wrong, I love them individually, but together is a fragrance experience that is very exciting; I’ll have to try mixing up EdOV with the other two and see what I get! Thanks! I’ll have to try some of those combos. Hi there, I smelled these two yesterday. Pamplemousse Rose is very nice, but at the same time a little too “Synthetic” to me. You say fresca, I say “some grapefruit scented floor cleaning product that I smelled at the gym”. Unfortunately that kills it for me. Although I only smelled them on paper, and being an Ellena creation, I’ll give this the benefit of doubt and will try them on the skin later. On the other hand, gentiane smells DRY! and GREEN! (yes, in CAPS and exclamation points :-D) very nice. When you say “flowering herbs” I totally agree. I don´t get lavender, but probably the gentiane itself smells vaguely lavender-like. Let’s hope it doesn´t look dated in a couple of years!! The previous Eau d’Orange Vert packaging was good enough for me, and looked very classy IMHO, I wish they had went that way with these two..
Do go back and try them on skin…I found both of them quite different than I expected after trying on paper. Gentiane esp. changes after 20 minutes or so. Well…I finally was able to sample these at Bergdorfs…while RETURNING…yes RETURNING…a bottle I really didnt love. Anyhoo…what a potent blast of grapefruit from the PR…drydown nice too! I don’t intend on buying it…but it was nice. Chandler raved on his blog recently. GB on the other hand…smelled NOTHING! Literally nothing! Hmmmm. SA gave me a sample, maybe I will try it again. Aha…I think you have found a musk you can’t smell! Very late to the party as usual, but both of these are now on fragrancenet.com – I am battling my “oh, just buy it” urge … I also went to the Hermes website, and they no longer list Hiris as one of their women’s fragrances – panic! It’s such a beauty, what are they thinking?? Loved the comments about Moxie: we used to drink this when my family lived in Buffalo, and a local (male) Airedale in our neighborhood was named Moxie. He was a sweetheart, and was deeply in love with our collie (Scotand’s Bounty, named after an article in “Gourmet” magazine). He would lie on our driveway with his nose under the garage door, hoping for a whiff of her scent. Fragrance ruled his world too! I am going to do myself a favor and not even go look at the price! On the Hiris: Hermes removes things from their website when they’re out of stock, and Hiris has been removed & then reinstated before. So hopefully that’s all it is, but I’ll keep my fingers crossed too. Beauty Encounter has them for $60-65, plus through today, they have a 20% off sale going….if you’re going to do it, now would be the time. Wish I’d been able to find a tester before now. Drat, wish you had not told me that! I paid full price. Sigh. Isn’t that nice? Very happy with my bottle. Now you need to go to a Hermes boutique and try Osmanthe Yunnan. I live in Pakistan and its just come into stores now. Tried it today and loved the opening.. still making up my mind about it! That was a long wait! Did you try the Gentiane Blanche? Did not know it existed! Will have to look into it, but I really like the original, & it’s hard to redo a citrus that way without it going flat/squat. I have a Hermes boutique, but not going in that mall until AFTER the holidays! I tried just today the Gentiane Blanche on paper. It is quite herbal and reminds me the Capucine by Chloe. I prefere the second one.